What is the Night Guard ? 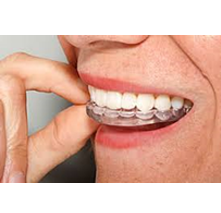 A night guard, also known as a bite guard, is an appliance prescribed to patients to treat their teeth grinding (bruxism) habit. In general, it protects the teeth and other vital structures by offering a protective barrier between the upper and lower teeth. The difference between the different types of prescription night guards is in the material used. Over the counter night guards do not offer this option, which is another reason why professionally made night guard are superior. The night guard is a rigid appliance made from Acrylic, It can last up to 5 years or more with regular use. Since it may be used for such a long time, it is important to regularly clean and care for your acrylic guard. 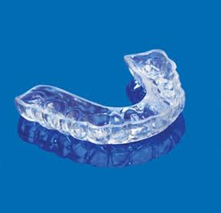 Because the acrylic night guard is made from a completely rigid material, it is very important to get a perfectly fitted custom night guard. If the impression is not accurate, or if the craftsmanship is not perfect, the night guard may simply not fit onto the patient’s teeth. • Wake up pain in your face’s muscles due to muscular spasm at grinding. • Pain in your mouth joint (TMJ). • May be your room mate can hear the voice of your teeth grinding at night. To find out if you are in need for the night guard, you can see Dr Yousif for a recommendation. He might offer to make you a custom made night guard.